Ever had a bad day which turns into a whole week? Negativity is an exponential curve, in the WRONG direction, and we don’t realise what’s going on until our little world’s are spiralling out of control into an ominous pit of depression, despair, anger, frustration and all those emotions on the wrong end of the spectrum. Some people are naturally positive. Other people despise these people… I won’t comment. What I will say is that once a critic, I’m now a huge fan of this neat little trick so many people love to preach (and blog) about. Positivity. It truly is an art form. And there’s a bit more to it than slapping on a smile and a bit of lipstick and pretending that everything is peachy. Positivity is a mindset and a never ending spiel of silent self-affirmation. That said, it’s an art form that I’ve put into a three-step paint-by-numbers approach to save you all the digging and researching that I did a few years ago. Do you talk to yourself in your own head? Of course you do. And if you haven’t noticed yet, start noticing because that’s where positivity begins. Our self-talk is a conversation with the universe, and our conversation with the universe is how we determine what we attract into our lives from that positive to negative spectrum I mentioned earlier. This admittedly took me a while but once I got the hang of it, the habitual part kicked in pretty quickly. When you wake up, observe what your thoughts are for the day, i.e. your self-talk. This was me a few years ago. But then I also took the effort to notice the moments of joy, like the “Yay, my bank just refunded all the charges because they made a mistake”… and the “awh my boyfriend cleaned the kitchen before I got home”… even, “woohoo, the cat actually peed IN his litter tray for once”… once you’ve mastered the art of awareness then you can move to the next step. It’s a habit. This only has to take 21 days if you commit to it. STAY POSITIVE. I don’t mean fake it. Faking orgasms is OK, this isn’t! Next time you notice a negative thought in your head, stop it before you get to the end of the sentence and either force another thought (distract yourself) or find the silver lining. I’m not asking you to jump for joy because your boss is calling you in for a ‘chat’ and chances are it’s not going to be a “hey you know what you’re doing so great take the rest of the week off on double pay” because stuff like that just doesn’t happen no matter how positive we are (sorry), BUT you could instead choose to think, “OK, whatever it is, I’m sure it’s happening for a reason, I am positive, I am a good person and I will embrace the outcome whatever it is”. THINK it and chances are the outcome will be a lot better than if you went in there with a negative mood. Thoughts and moods are energies, and energies send out frequencies into the universe that come back to us. So, if you project a negative energy on your boss when you have that ‘chat’ you’re far more likely to get a negative outcome. Do the opposite and you’re going to walk out of there feeling a LOT better than the previously programmed alternative. Same applies to all other people, relationships and situations in our lives. Distracting yourself can also work because often these things we are being negative about are completely unnecessary and IMAGINARY. I’m referring to the art of worrying. Women in particular are absolutely fabulous at this. I certainly was an A* student a few years ago. Don’t worry about the future. Worrying about future events, even five minutes in the future, will guarantee the potentially negative outcome will stroll straight on into your life looking for a picnic. Don’t invite him. He was NOT invited. 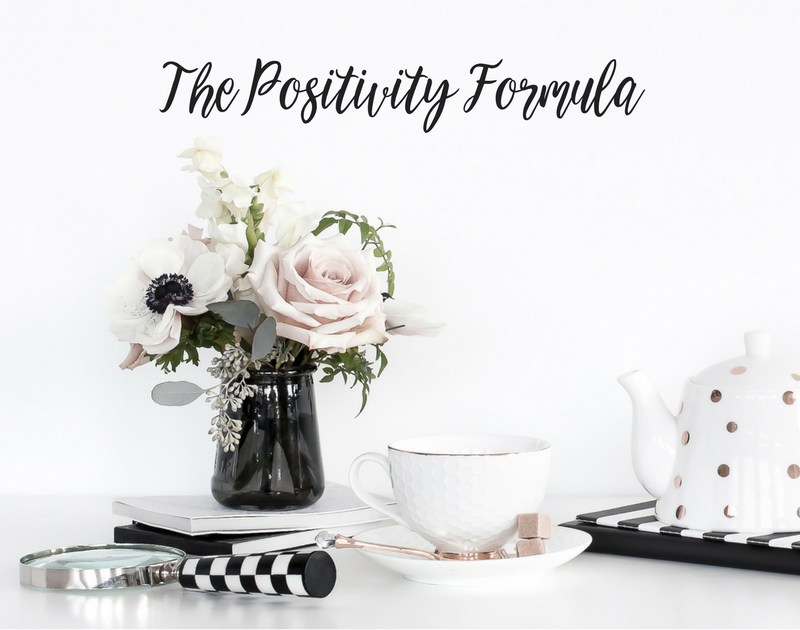 Do not put that RSVP in the post, drop it in the bin, drop it from your mind, and turn your thoughts to something more positive like how damn fabulous you are for introducing this new positivity habit into your life. Right?! Right. OK so you’ve kinda got the self-awareness thing down; you at least hear your negative thoughts so you can stop or change them before they manifest. And then you kinda get the habit thing; it becomes routine to correct your thoughts so you’re feeling much better than you were a month ago. Step 3 needs to see RESULTS and this is a CHOICE. You can choose to never let negativity knock on that door ever again. Why? Because you can choose what you think, and subsequently FEEL about a situation. Positive thoughts = positive feelings = positive LIFE! There’s no room for negativity in that equation. A three step approach to changing your mindset forever? Really?! Well yeah… I’ve read all the books, I’ve subscribed to all the courses, it doesn’t take more than 1000 words to type up the basics. Don’t be fooled, there’s no big secret, and the basics pretty much cover it anyway. You CAN do this. You’ve already done this and lived this life… when you were a child… you weren’t capable of negativity. You also weren’t capable of complex psychological analysis so if it wasn’t required then, it isn’t required now. You are in control. You just need to develop your awareness, introduce a new habit and then sustain the choice. Simples. Let me know how you get on, I’d love to hear from you!